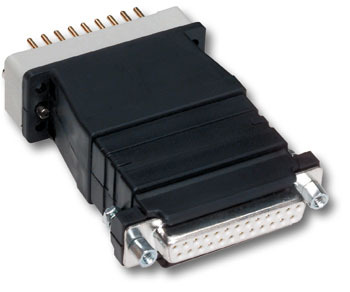 Connect RS-232 to V.35 using any gender and connector variation imaginable. The Model 2020 Series solves one of the most common problems in WAN connectivity-connecting sync RS-232 hardware to sync V.35 hardware. And the Model 2020 series offers many different models to choose from. The Model 2020N is the perfect solution for converter applications that do not require a built-in cable. It has all the features of the Model 2020 series contained in an ultra-miniature package.